Find the ways I best learn and then seek out those opportunities. These practices have done far more for my professional growth than any observation/evaluation ever did. 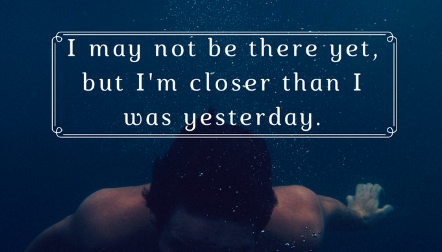 How do you continue to progress? This fall, I worked with a great group of educators in Texas as they begin the process of transforming their instruction by integrating technology into their daily lessons. I led them through a two-day process of evaluating their current teaching and thinking critically about what changes they can make in the way they interact with and instruct their students. Toward the end of the first day, one of the young teachers approached me and explained how she began the school year teaching economics, but just a couple of weeks prior, due to staff changes, the principal came to her and asked if she’d switch and take over the AP Macroeconomics classes. What do you say to your principal, but yes? So she accepted and has been in survival mode ever since. She was frustrated by the required textbook and how boring she felt her class was (contrary to how she’d like to be teaching), and couldn’t see how to infuse technology into such a rigid curriculum. I could’ve just heard her words, told her a couple of quick tech tools and sent her back to her table. But that wasn’t what she was needing. I chose, instead, to truly listen to her. Strong leaders take in all of the information available to them when they listen. I focused on body language (this poor lady was ready to bolt), the tone of her voice (strained, at best), and the actual words she was saying (she was literally crying for help). Then, I started asking questions. I went back to her seat with her, pulled up a chair, asked questions, and continued to actively listen. I asked her to show me the curriculum she was supposed to use. I asked her how the students could access it. I asked her how she liked to teach in other courses. I learned so much through asking questions and listening, that I was able to be a much better support and serve her more effectively by listening first. Do you feel listened to, or merely heard? If you are in a leadership position (and teachers, you are all the leaders of your classroom, so this definitely applies to you, as well), do you take the time to actively take in all that people are (and aren’t) saying to you? To be a servant leader, we must first be active listeners. This makes the journey about those we are serving, and not just about a title or position. The focus moves away from us, and onto those whom we are serving. 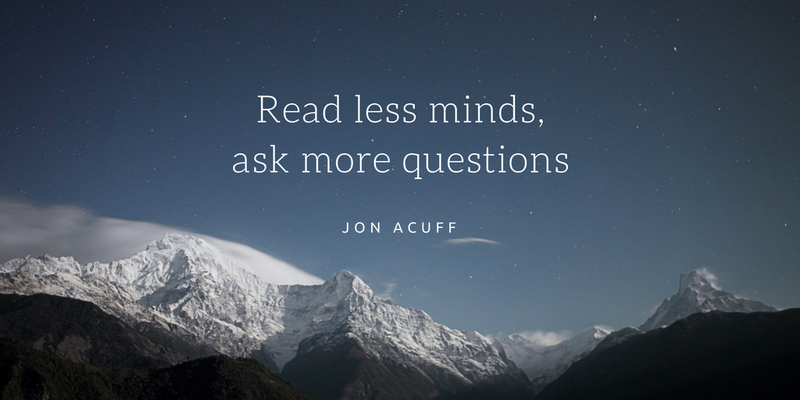 So ask questions, and then just listen. All learners deserve the opportunity to own their learning. They take this ownership when they have input into the what or the how of instruction. The more choice you offer students, the more they will embrace the learning. With technology integration, we no longer need to rely on the teacher as the sole expert in the classroom. Now we can access experts around the world, including those sitting in the next desk over. Student-driven classrooms empower students to synthesize research to address authentic tasks. Mrs. V does a great job fostering research and information fluency skills with her AP Government class. One recent project involved students using resources and technology to explore the different types of campaign ads. They researched various campaign ads, identified key details of each type, and then worked with peers to create a recorded ad that either attacked the opponent or flattered their chosen candidate. In addition to understanding campaign ads, they had to have a working knowledge of their candidate and his/her opponents. In student-driven classrooms, the students use appropriate digital tools to collaborate with peers and experts regardless of physical location in meaningful and purposeful communication. Mrs. S often designs challenges that promote collaboration within and beyond her classroom to address authentic tasks. In a recent visit, I saw her introduce the newest student-led projects. The ninth-grade students chose which groups they would work in and assigned roles for each student within their group. Students will access assignment information within Blackboard. They will communicate with Mrs. S and each other via email, texting apps, Blackboard, and Google Drive for communication and collaboration throughout the project. Mrs. S introduced a GANTT sheet and how to use it for time management and accountability. She also set midpoint conferences where every student meets with her to show work that they have completed to date. Students are driving the communication efforts by choosing the appropriate digital tools to complete all aspects of the project, while also using the group norms they established within their groups. In student-driven classrooms, questioning techniques and critical thinking strategies are enhanced as students work to solve problems in authentic tasks. Ms. W works with eighth-grade students in an alternative school. Some would argue that she has an even bigger challenge in engaging students in relevant learning. She gladly accepts that challenge and works diligently to provide her students with authentic learning opportunities. Recently, her students learned about Hurricane Katrina through video, first-hand accounts, and research. They also discovered that New Orleans is at risk for flooding again. 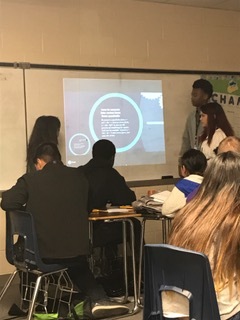 They used that information to create a solution for how to prevent mass chaos/death again and created presentations using Google Slides to share with the class. They synthesized their research to provide three solutions that would help prevent the damage done during Katrina. This is a real-life problem that the students are working to solve. Creativity and innovation are fostered in student-driven rooms because students get to develop original ideas and create products by applying critical thinking, research methods, communication tools, and collaborative processes. One example of this comes from Mrs. M’s English 3 class. Students were given a list of topics referring to the Great Depression and its impact on America during the 1930s. Each student chose one topic to research and then created an original digital project using: Prezi, Word or Publisher (brochure), LucidPress, Posterini, MakeBeliefsComix, or a video app. Mrs. M strives to introduce students to new creation platforms to increase their comfort levels as they build their repertoires. At the same time, she empowers them to find other digital creation tools that she has yet to discover. All of these experiences, designed by the teachers and those that happen organically, move students to engage at a deeper level and allow for real learning to occur. I use the TIP Chart when working with teachers on increasing student-driven learning via best practices surrounding technology infusion. Here are a few snippets from recent visits at the Bill R. Johnson CTE Center in Crowley ISD. Mr. H teaches a Correctional Services class. The lesson I recently observed involved students creating radio communication tools. They were given access to the Course Communication List and then collaborated as a team to determine if they needed anymore 10-codes or codewords. 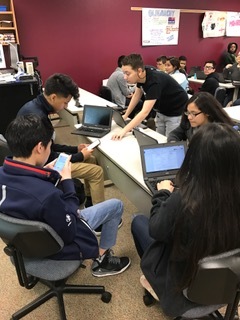 Students accessed their research and information fluency skills to research other department 10-codes for examples as well as to think about codes that would have helped in previous scenarios they experienced in prior classes. Their jobs were to create tools that explained proper radio communication and proper use of duress codes to other law enforcement classes. They were split into two groups for the project. One of the students is the Captain of the class (voted as such by his peers), so he appointed the topic to each team leader. Lieutenants (Team Leaders) were charged with making sure their teams remained on task. There was a group participation rubric to guide the teamwork aspect, as well. Prior to this lesson, Mr. H had shown students some various tech resources (Marvel Comic Maker, Storyboard That, video, Prezi, etc.) that they could use to create a final project that would teach about their particular communication tool. Students were actively engaged throughout the class period. Mr. C teaches Advanced Commercial Photography. I visited during a lesson on studio lighting. For this lesson, the students worked in groups to research a studio portrait style that they found visually interesting. Then they worked to replicate that lighting style by first using lightingdiagram.com to virtually place their subject, camera, lights and background. Once complete, the pair/small group went to the studio to use that diagram to place subject, lights, and camera in a similar arrangement to see if their capture was the same look as the one they researched. Through research and collaboration based on prior knowledge, the students learned about the placement of lights, exposure, shadows, form, key lights, fill lights, background/hair/rim lights, while using online software to plan before they shoot. Their critical thinking skills were tested if the lighting diagram planning failed to yield the “look” they were hoping to achieve. Mr. C intentionally designed this opportunity to allow students to synthesize research, communicate/collaborate with peers, and apply critical thinking skills to address an authentic task. Mr. M teaches an Advanced Film class. During my most recent visit, the school was having a pep rally. Mr. M’s class was responsible for filming the event. They had to employ knowledge of recording equipment by using proper monitoring of equipment to ensure quality recordings; setting appropriate levels before recording using broadcast standard tools; identifying standards for logging notes or comments in the original recording process. The students were given crew positions the day before the pep rally and were to fulfill the requirements of each position during the production phase of the pep rally projects. The setup was similar to other events some of the students had previously filmed so those students were able to take on the teacher role in different aspects of production. One student was the director who decided where the cameras were set up and what shots the cameras needed to cover. The director wore a headset that allowed him to talk to the other students to give them instructions throughout the production. I saw evidence of student-driven learning in various areas. The students accessed prior knowledge and experience to address the authentic task of filming the pep rally. Communication and collaboration among peers took place throughout the pep rally to ensure quality results. More communication and collaboration happened after the pep rally during the editing process. Students used critical thinking and problem-solving skills to determine key placement for setup, camera lighting and positioning. You may not teach photography, corrections, or film, but what strategies did these three employ that you could apply in your classroom? This journey to student-driven classrooms is about transforming instructional practice, and these teachers are setting the pace. I grew up in a small town. I’m raising my children in that same small town (I know. Sounds like a John Mellencamp song). While I love small towns for many reasons, I do get a bit envious of the learning opportunities that bigger districts can provide. One of my favorite districts to work with is Crowley ISD in Crowley, Texas. They have a CTE center there that boasts of some of the best teachers I’ve ever met. For many of them, teaching is a second career after leaving the military, law enforcement, or some aspect of the business world. I’ve written about some of them in the past. I got to hang out with them again this week, and they brought their A game just like they always do. The class I observed taught by Mr. P was Principles of Engineering. When I visited, the students were already a week into their projects, and on day four of the collaborative design phase. 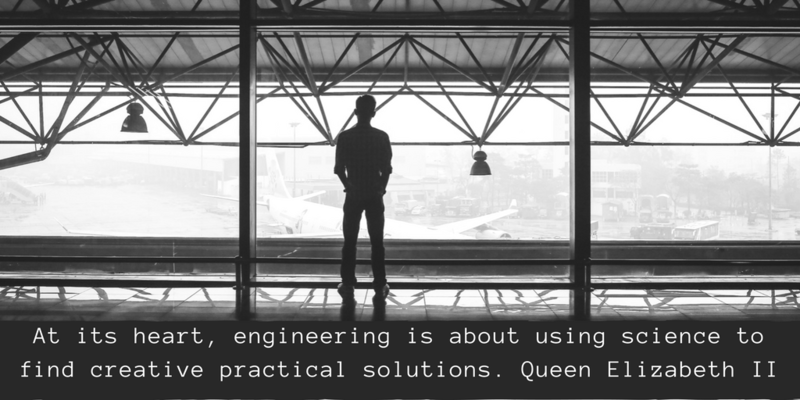 Their purpose of the project was to design, create, test, and evaluate a compound machine while collaborating effectively with others in a design team. I love this sentence from the lesson plan Mr. P shared with me prior to my visit, “There is no one lesson or objective today as students will be directing me to assist with whatever “step” they have achieved.” Doesn’t that statement get right to the heart of student-driven learning? The students were all designing, building a model of, and then completing a CAD of a machine that could remove the hardtop cover of a Jeep. They had an authentic problem to solve. Before my visit, the students had already sketched their designs on grid paper. They were all in the model-building phase, choosing from a variety of materials (i.e. Fischer Technik, Legos, or VEX components). While circulating among groups, Mr. P saw a common issue that needed to be addressed. He was able to pull them back together as a whole class to demonstrate how to draw a gear on Autodesk CAD design software. The students would watch him draw a step, and then they would do the same on their own computers. This was a step they would all be taking next in their projects as they all incorporated some type of gear into their machines. At the conclusion of the project, students will write a reflection piece about themselves, as well as evaluate their peers as part of the collaboration process. The groups will vote on the best design to then build to scale and test on a real Jeep. Doesn’t get more real-world than this, right? If you like these practical examples of real teachers facilitating student-driven learning, stay tuned. I’ll be sharing more stories from Crowley ISD soon. I get to work with teachers of all grade level and all content areas. That’s one of the best aspects of my job. I normally don’t like to make generalizations, but just this once I’m going to. In my experiences, math teachers have usually been the most vocal with me as to why technology integration and/or a student-driven learning environment don’t work in math. (Now, in their defense, I’ve heard that argument from just about every grade level and content area at some point along the line.) I take extra delight, because of that, when I get to work with math teachers who completely change their minds in that regard in a fairly short amount of time. Think back to how you learned math. 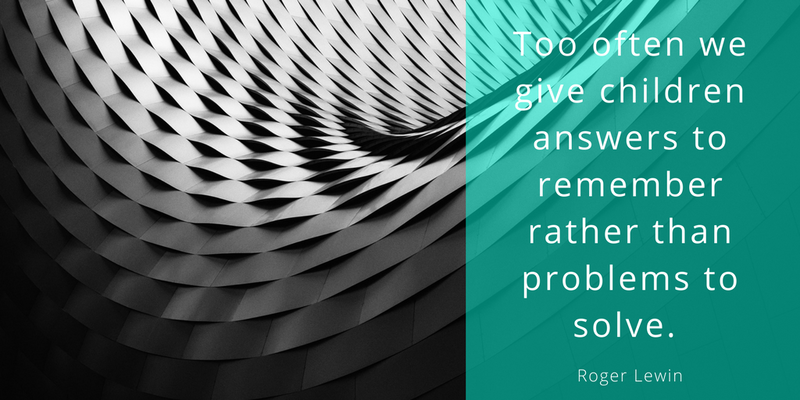 Chances are high that your math teachers lectured, demonstrating how to work through problems from the front of the room, and then provided you with problems to work out yourself using this information. You probably memorized rules and formulas, postulates and theorems, and then prayed on test day that your memory wouldn’t fail you. You probably wondered at some point, “When am I ever going to use this?” Or, “How does this apply to my life?” If you were lucky like I am and that stuff just makes sense, then math was a decent experience. If you were like my husband who was the one asking those questions above and looking for any and all extra credit to pass each math class, then you probably commiserate with students still learning like that today. While math was fairly easy for me, I’m horrible at trying to teach higher math concepts (something I have to do often with my teenage daughter). I know how to solve the problem but can’t explain it to her in a way that makes sense. I don’t know the why behind the processes. I recently wrote about a fantastic experience I had working with Mrs. E. She was a very traditional math teacher up until the fall of 2016. You can read more about her transformation here. The best part is that she isn’t an anomaly. I got to work with three other math teachers in the same district and watch their growth throughout a five-month period, as well. 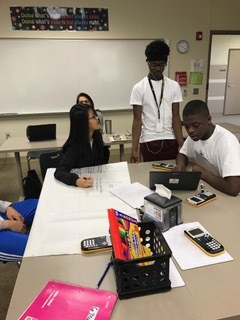 Mrs. W’s tasked her Algebra 1 class with developing presentations to show their knowledge of Quadratic Equations in standard, vertex, or intercept form and describe the effects of the graph if any given variable is changed. 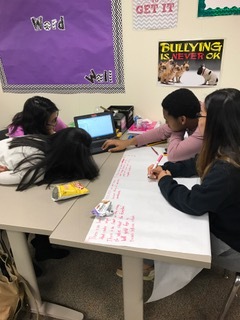 The students chose their small groups and conducted research based on which form was assigned by Mrs. W. They had guiding questions for their research, but then had to construct three to five questions for their peers to answer following their presentations. The students were able to choose which platform they use to share the information and I saw Prezi, PowToons, and PowerPoint all being used. Following the presentations, students evaluated and gave constructive feedback to their peers about the content and presentation. Ms. H teaches an inclusion class for Algebra 1. She works hard to differentiate her lessons to meet the needs of each unique learner. This past visit to her classroom, I saw the most student-directed learning yet in her class. She created a choice board for her students to choose from to learn the vocabulary for their new unit on parts of a quadratic. In introducing vocabulary in this manner, the students had to research and define each vocabulary word instead of just listening to the teacher or reading the definitions. They were in charge of their own learning, and the synthesization of that information in order to complete their chosen project showing their new knowledge. Check out her board for more ideas on how she used technology integration to increase their learning choices. Mr. M teaches freshmen in an early college academy at Crowley. He also shared a thank you with me last week for pushing him to be more student-directed in his instruction. One important item to note is that I noticed Mr. M’s outstanding classroom management and excellent rapport with his students from the beginning of our time working together in the fall. These strong foundations allow for an easier transition into student-driven learning. It’s also fun to note that all of these teachers were teaching quadratic equations to their Algebra 1 students, making it easy to see much variation in the same topic area. The day before my visit, students were given a blank graphic organizer over quadratic functions. They used technology to explore the properties of quadratic functions to fill in the graphic organizer. Mr. M had also shared a video via EdPuzzle with his class to provide more information. After completing the graphic organizer, they worked with partners to present the material through whatever media they wish to use. They created their own quadratic equations then created a presentation that showed a graph representation of the equation. They had to determine the vertex, width, domain, range, the direction of opening, and the axis of symmetry. It’s difficult to give up control in a math class. These teachers have made great strides toward releasing some of that control over to their students. If you are determined to transform your classroom into a student-driven learning environment, keep increasing their opportunities to make choices and find their own learning while giving them the vision of how math relates to their own lives. It works. And the students will thank you for it. 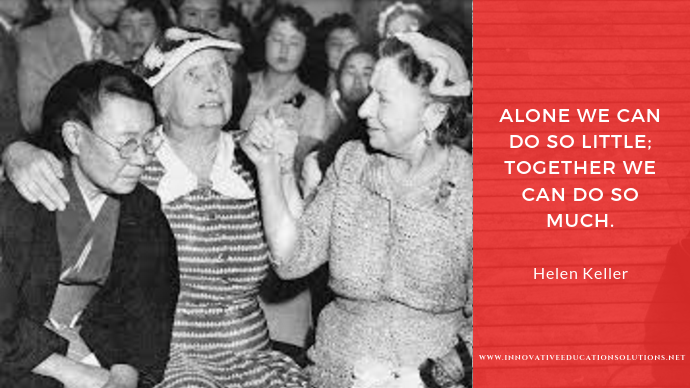 Have you ever heard the quote, “When one teaches, two learn”? Gone are the days where the teacher is the only expert in the classroom. Classrooms need to be a place of a community of learners—the teacher included. The Methods of Teaching and Learning Need to Change. I become a bit giddy when I get to visit classrooms where the teacher already understands this—when a visitor has to look to the fringes to even find the teacher in the room. 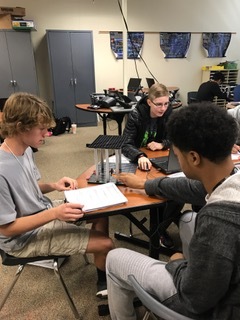 In one week of visiting Crowley ISD in Texas, I witnessed the collaboration of learners in classes such as Math, World History, English, Audio/Visual Design, Computer Programming and Aerospace Engineering. Students chose an aerospace advancement or achievement to research. Their teacher, Mr. P, gave them some guiding questions to use during the research but allowed them a choice in how they could present their learning to their peers. They had to be ready to justify why they selected that information to share. At the end of the project, the students will spend time reflecting and elaborating on what they could change/improve creatively for the next project. Mr. R, the teacher, gave the students the mission of writing code for a BB8 Sphero robot. The students jumped right in and started figuring out how they were going to write the program. This is the decision-making process of programming. The objective was to use the Lightning Lab app to program the Sphero to move in a square down four different hallways. The students walked the halls, timing how long it took them to get to each intersection to use as a basis for their code. After writing the code for the Sphero, they took it out to the hall for the first trial. It was fascinating to watch the learning process unfurl organically as the students tested each program, collaborating on the successes, failures, and adjustments needed after each trial run. This was so much fun. The students each researched an important historical event and then wrote a script for an episode of the television show, Timeless. The author of each script became the director. They cast the episode and assigned roles to the other students in the class. Here, the Author-Director is laying out scenes with her actors while her Director of Photography gets photos for her storyboard. The writers had to work with a $0 budget and spent time walking around the school to block where different scenes would be shot. For the episode I watched being laid out, scene locations included their classroom being converted into an Apple Store, an outside corner of the building being used as the backdrop of an alley in New York City, and a science lab being staged as a classroom. Mr. M, the teacher was a strategic observer as the students were making decisions about their personal projects in real-time. Other students offered opinions and insight as the scene unfolded. That’s Great for Electives, but What About Core Subjects? I know some teachers may be thinking this—how can I give up control when I have so many standards to meet prior to state testing? Great questions, but not very valid when talking with those teachers who are doing just that. One teacher I know has made intentional changes this school year to move from teacher-directed instruction towards student-driven learning. Recently, she assigned her students to work with a partner to create a PowerPoint to show the Laws of Exponents. At the end of their PowerPoints, they have to ask questions that their peers should be able to answer from the content of the presentation. These questions at the end are essential to getting the students to think at higher levels. Students will conduct a peer review using a teacher-created rubric to evaluate Content, Slide Creation, Slide Transitions, Images, Grammar mechanics, and Tech Connection. After talking with Ms. W, she shared her desire to offer more student choice next time by letting them select the platform for the presentation. This is a great next step, and it may require her demonstrating how to use something (i.e. Comic Strips, Prezi, etc. ), and restricting their use of PowerPoint. Otherwise, most students will stick with what is “safe” and what they are most familiar with. I also suggested getting the students to provide input in constructing the next rubric, so they are driving the assessment as well. As an interesting side note, Ms. W communicates with students outside of class via Remind and Kik, encouraging communication and collaboration beyond the classroom walls. I always enjoy visiting this class. My most recent trip showed the beginnings of an Interest Group Research Project. Students chose their groups (with 2–4 members), chose their interest group, and then discussed how they would present their project (live action vs. animated). Their mission was to research a group and then create a commercial in order to persuade and entice people to join their group. In addition to the commercial, groups must turn in a two-page typed essay answering the teacher-created questions to show thorough research. They were given one week to complete both portions of the project. Too often, projects are given too much time, drawing out the process and killing the engagement level. One week was sufficient time to research and produce their learning while maintaining interest in the project. As a result, the class will learn about fifteen different political interest groups while driving that learning themselves. 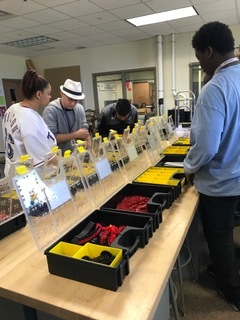 Ms. M teaches this high school class where she is now focusing on student-driven activities for research, communication, critical thinking, and innovation. While I was visiting she assigned a research project that students will complete using PowerPoint. Each pair chose a persuasive speech topic; they will create an original PowerPoint supporting their opinions and have to research data for one of their reasons. Then, they can research more information, but by requiring at least one rationale they are able to practice citing sources including pictures/videos. In addition to research, students are required to incorporate slide transitions, animations, picture and videos to enhance their PowerPoint. For the next project, she may consider opening up presentation platform choice to include more options, maybe even stepping away from Prezi/PowerPoint format altogether. This was a great choice of assignment as it enabled the students to concentrate on research and persuasion strategies. I get to work with teachers all over the United States. These are only a few snippets of what I get to experience watching them move toward a student-driven learning environment. They share a common mindset of wanting to create space for students to be engaged in their learning by taking ownership over it. Traditional teacher-directed classrooms are not necessary for, and actually prohibit, success on standardized testing. Deeper connections are made through authentic learning experiences. These teachers understood that and they have the pleasure of watching those connections happen in the minds of their students. What is the ideal blended learning environment? I have had a lot of noneducators talk to me about technology in the classroom. Most don’t have informed opinions (so I’m happy to share mine with them). Many ask me what the best device is for learning. Sadly, I’ve even had educators argue this point with me in favor of one particular device. Good teaching and sound student-directed learning is device-agnostic. High-quality learning can happen on laptops, Chromebooks, tablets, and cell phones. It’s not the device that makes the difference. Just like there are definitely instances where the best learning occurs with no device. In addition to the type of technology, I often hear that blended learning can only happen in a 1:1 environment. 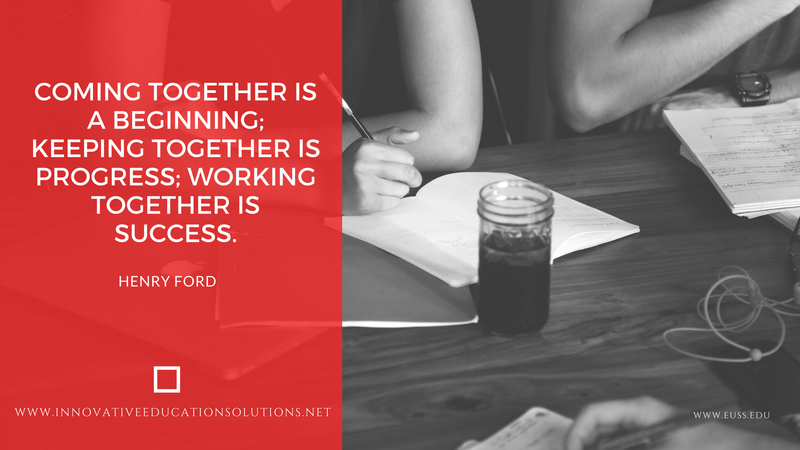 While 1:1 is fantastic, not all school systems have the infrastructure and/or finances in place to make this a reality. So instead, I ask if you only had six laptops in your classroom, how would you best utilize those as learning resources? I’ve worked with several districts where this was the technology implementation model they chose to employ. Some teachers get hung up on the fact that they only have a small group of devices and can’t visualize how to use them for true learning. Sadly, that means they often don’t get used at all. Others are so excited to finally have something in addition to their interactive whiteboards that they jump right into the integration. Overall, do you know the grade levels that seem to take off the easiest with this model? The primary grades. The reason that it’s generally easier for them to see how this model could work for their students is because they are already accustomed to using learning stations in their daily instruction. 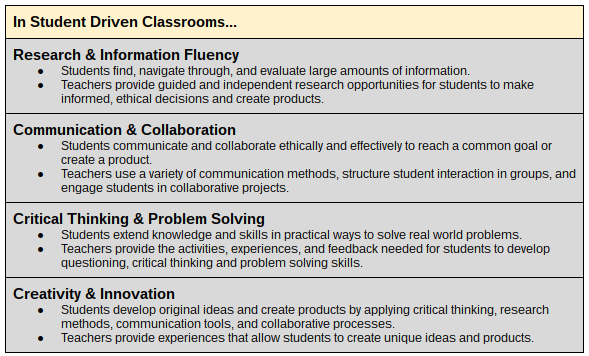 In one K-8 district that uses this small-group model, I saw all of the following ideas implemented in classrooms via learning stations: Hour of Code activities, math practice through game-based learning (DreamBox), digital projects that show evidence of student-driven learning (Piktochart, Google Slides, iMovie), reading fluency and comprehension practice (ReadWorks digital, SeeSaw, ReadTheory), virtual field trips (Google Earth, Nearpod), and formative assessments (Formative, Google Forms, Socrative). One very fun kindergarten teacher utilized every bit of technology she had access to. One learning center was at her interactive whiteboard where a group of students played a game working on letter sound recognition and identification. Another center had the classroom’s six laptops to work on English-language learning skills. A third center used three iPads that the teacher has gotten through Donors Choose. The fourth center was a writing station which is integral for emergent literacy practice and fine motor development. This teacher is not limited by a fixed mindset. Her classroom is a lively and engaged place for learning across many platforms. Another questions frequently asked is, how does digital learning work with electives? An art teacher I am working with has students bring laptops from a STEM lab with them to art class. Her goal is to divide her class into two groups. She would use direct teaching methods to instruct on practical/visual arts to one half, while the other half applies art theory via digital design. Each half would get time to create using multiple mediums. I was in her classroom for the first time that she pulled laptops into her instruction. These sixth grade students had experience working with a 3D printer from their STEM lab, so she built on that background knowledge. Using her document camera and an iPad, the teacher demonstrated how to take a 2D image that one student had previously drawn, and alter it to become a 3D image ready to be printed. Her challenge for the students was to find and/or create an image to be made into Christmas ornaments for the class tree. It was fantastic to observe these preteens completely engaged in the work, while having the freedom to choose the medium for creation. They worked in small groups of four, and while the project itself was individual in nature, good collaborative conversations were happening throughout the process. The result was a fantastic art project that built on work the students had done previously in and outside of art class. When I work with teachers who teach upper elementary, middle and high school, I often recommend a station rotation model to make the best use of a small group of digital devices. I like this framework for any grade level, but I think it is easier to visualize for higher grade teachers than typical primary learning centers are. I recommend a small group station where the teacher can direct-teach (or reteach), an independent station (this is where I would put the six laptops), and a collaborative station where students work collaboratively with their peers on a performance task. This is a great way to structure a class period while meeting with every student and allowing students to work digitally every day. Rotating through these different stations keeps students engaged in their own learning, while giving them the need and space to take control of it, as well. The focus is taken off of the teacher delivering content and placed on the students. People will always be able to find the roadblocks. The best teachers find a way around them or a way to remove those obstacles altogether, but putting student-driven learning at the front of the equation. Impactful learning isn’t limited by grade level, subject-area or the resources available, but only by the mindsets in the room.